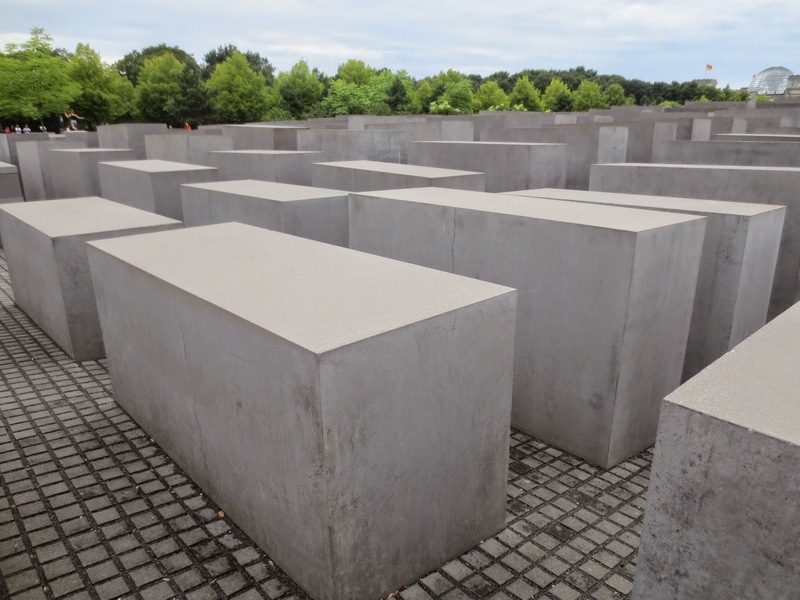 The Holocaust Memorial, also called The Memorial to the Murdered Jews of Europe, is a collection of 2711 concrete slabs built in honour of the Jewish people slaughtered during the Second World War. 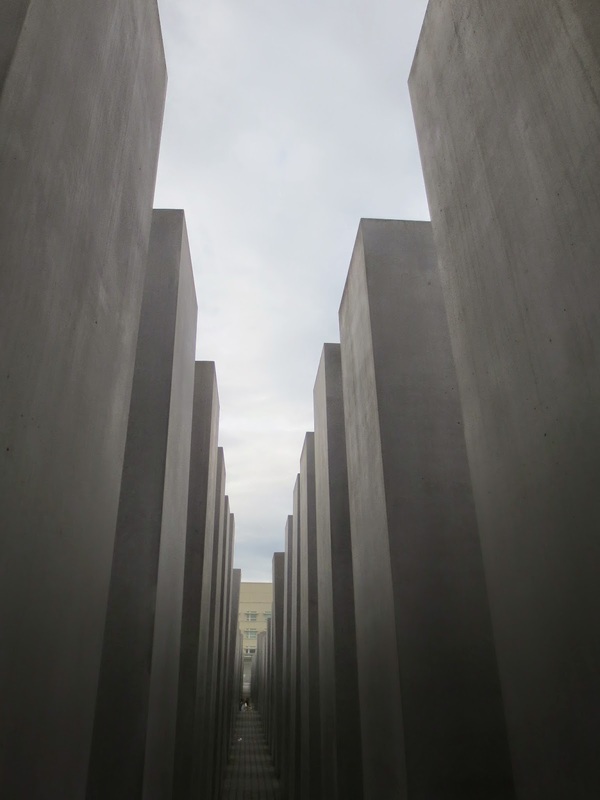 Located on a five-acre plot near Berlin’s Brandenburg Gate, it resembles a field of tombs when seen from a distance. But as we entered the memorial, the unmarked stones gradually grew from a height of several inches, to towering over our heads. The architect has explained that he hoped to create a sense of imbalance and disorientation for visitors. He chose the number 2711 at random, to help depict the senselessness of the killings. As Andrew and I walked quietly through the paths created by these stones, it was difficult not to feel overwhelmed, even claustrophobic at times. The adjacent Place of Information contains the names of all known Jewish victims of the Holocaust. Over 3 million victims are named. The following poem was written about the loss of innocence brought on by the First World War. I can’t help but imagine there was a similar loss of innocence when the extent of the horrors of the Second World War were revealed. Really touching Beth. Always make me sad think in that, the other day I saw a movie the other day about this, so sad. Thanks for sharing! Wow. I've never been to Berlin, so I haven't seen this memorial. It looks really moving, really powerful. Things like that can be so hard to visit, but so worth it in the end. There's a haunting beauty to those towering grey stones. Haunting is right. One couldn't come away unmoved from the experience…hope to get to Berlin one day. To watch the pictures of the monument and to read the poem is really moving. For sure an impression one never will forget. Would love to visit Berlin one day. What a moving post Beth! would love to view this memorial someday. That was such a powerful and emotional poem. It's amazing how simple they grey stones look but speaks volumes in meaning, history and emotion.Thanks for sharing this with us. Amazing post. Thank you, Beth. Your post is so moving. Poem is incredibly emotional. Thank you for this post. It is extremely important to know that life is not all about internet and joy. i've always been fascinated by holocaust and find myself actually seeking out information about it, which is unusual for me and anything regarding something from the past. i loved your post. I remember reading All Quiet on the Western Front. And then seeing the Battlefields of Verdun. And all the existentialist literature coming out of the WW II period that seemed incomprehensible–until I thought about what such an experience must do to a thinking mind… Although a cliche, it really is important to remember. "Never such innocence, never before or since…" – that also fits for all of us that were born after the wars. Some innocence was gone even before birth.